The San Francisco County Transportation Authority (SFCTA) proposed the elimination of parking spaces along 19th Avenue to make room for a new M-Ocean View Muni line that would run underground through Parkmerced, during a meeting Tuesday, Sept. 23. Two conceptual designs, revealed by the San Francisco County Transportation Authority (SFCTA), would each run the M-Ocean View line underground from St. Francis Circle to Stonestown Galleria and possibly extend to Daly City BART, replacing the current M-Ocean View Muni line when finished. Some attendees, like environmental studies major Anthony Serna, are concerned about the proposed elimination of 19th Avenue parking, and the impact on students who already struggle to find parking in residential areas. The SFCTA has until July 2018 to finalize the M-Ocean View route through the area, under the Parkmerced Development Agreement. Caltrans is funding most of the project, but SF State has designated $1.8 million and Parkmerced, $70 million, respectively. The 19th Avenue transit planners deemed the first option — a longer subway and bridge design as the most effective, saving $2 million per year in operating costs and running 35 to 45 percent faster. The second option — a shorter subway and tunnel, saving $90 million, would return the M line to street level at Buckingham Way instead of continuing to run the northbound line underground until it reaches Parkmerced. The tunnel, however, would cost $160 million more than the bridge. Miguel Guerrero, Associated Students, Inc. health and social sciences representative, was also concerned about the 19th Avenue design plan. “To decrease the parking demand, we have to make sure public transportation is more affordable for students,” he said. The commute could get easier for students taking BART, with the proposed extension of the M line on a bridge to the Daly City station, costing an estimated $200 to 300 million. The study will conclude by the end of the year and the environmental review and design are scheduled to be finished in three to four years. Let me get this straight, an environmental studies major is worried about parking for students driving to campus? Not so Rogue Cyclist, just the way it reads. I am most concerned with public transportation being made affordable for students and increased bicycle and pedestrian safety of course. Hahaha I got misquoted! I said that community member concern over parking is only an issue because the lack of ridership on public transportation. 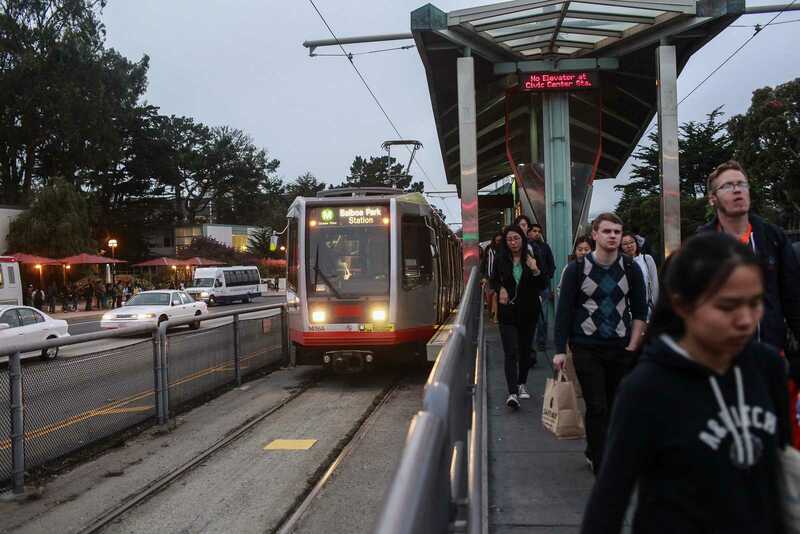 If muni could encourage more SF state students to ride public transit, or if people rode their bikes more in general, the concern for parking is unwarranted. But until more people decide against driving their cars to school because it may be cheaper than taking the bus, complaints over parking will continue so that is the issue I’m talking about. Honestly, it would be easier if there was a bike bridge on St. Charles/19th Ave where it bisected by Brotherhood way. That one steep hill is what most likely keeps people from biking from BART. I fail 2 see the humor in this misappropriation of yr words by resident-pants-hater Mojdad. The evidence is here folks…n if u care more about spelling than telling–they’res the door. The extension to Daly City Bart would be a huge benefit but was not initially considered for the project. All the concerns about parking are ridiculous considering the extremely small parking impact, but I still hold my reservations about the priority of this project. Given the limited capital funds available to MUNI, we could instead spend the money to continue Central Subway to North Beach while still expanding the M-line into Parkmerced. I am still pushing for improvements SOONER rather than LATER on the M. Any tunnel option will eliminate stops at both Ocean and Eucalyptus and eliminate three signalized crossings on 19th Ave. But if we consolidated the two stops, and then prioritized transit vehicles over cross-traffic on 19th, we could make significant inroads at a much MUCH smaller cost and on a much shorter timeline. Other improvements such as lane narrowing and pedestrian improvements such as corner bulb outs and sidewalk extensions would still be possible. With the realignment of the M through Parkmerced, additional signalized intersections will be avoided. For the remaining intersections, it would be beneficial to use RED concrete or asphalt to denote the transit lane and keep vehicles off.